Part 3: In Slovenia, "The Tree Needs to Look Beautiful." Franc Morgan’s farm is steps away from his family’s house in Grintovec, a small village with a population of around 80 in Slovenian Istria. His dog Collie — a black and white border collier — follows him while he walks down the unpaved path leading to the olive grove, planted in terraces that make the slope of the hill like a huge stairway. “I started from nothing, from zero. Just from scratch. Thirty years ago we planted the first 200 olive trees. Then 200 more… And now I believe we have around 1,000 trees”, Morgan tells Olive Oil Times. Morgan’s family had always produced oil for self-consumption, like many others on the coast of Slovenia, the only region of the European country where the climate allows olive trees farming. However, after his father died, Franc started thinking about what to do with his land in order to keep it productive. “I thought that with little work we could plant olive trees. Then we realized that it was not a little work but a lot of work,” he laughs. Going organic was part of Morgan’s plans from the beginning and he became one of the first organic olive oil producers of the country. “Nowadays it’s easy growing organic, but 15 or 20 years ago there was not a single registered product in Slovenia, let’s say, to treat the olive fly,” he says. When asked how it is like producing organic olive oil in Slovenia, Morgan’s answer is straightforward. “It’s as if growing organic was the natural path. We just continue doing things like it’s always been done”, Morgan says. “We have very good land to produce organic oil. Because as you can see, around us there are only forests. 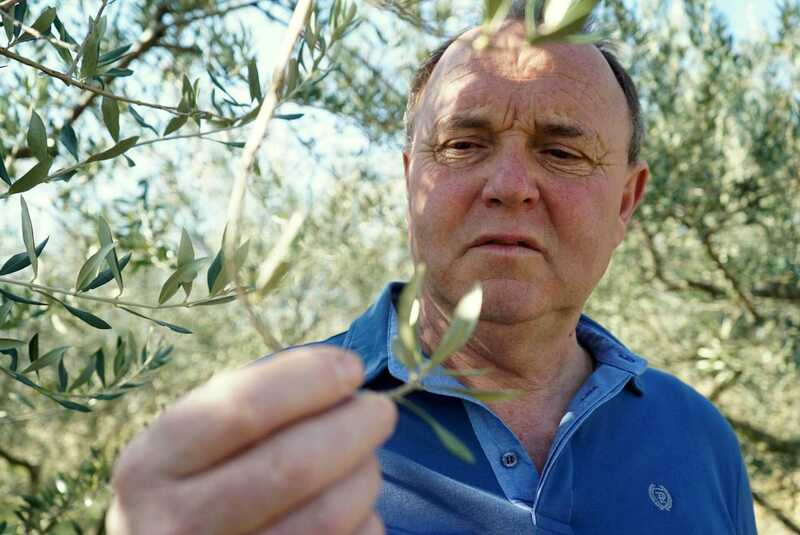 There is no traffic, there are no factories harming our olive trees,” he adds. Slovenia has an annual olive oil production of around 400 tons, according to the International Olive Council, far from neighboring Croatia, with 4,000 tons, Italy, with more than 185,000 and Spain with 1.6 million. The view from the middle of the grove offers a panorama of a quintessential Slovenian Istrian landscape: a deep valley surrounded by hills where forests, vines and olive groves coexist. It’s as if every hill had to be crowned by its own village. Smarje, on the left side, Grintovec, on the right, and Padna, with its subtle skyline and Venetian-like bell tower, on the other side of the dale. With a production of around 1,500 liters per year, the quality of Morgan’s organic oil is widely acknowledged. In 2018, the Morgans won a Gold Award for their organic medium blend at the NYIOOC World Olive Oil Competition. He sells 80 percent of the oil locally, exporting the rest, mainly to Germany, Austria and Italy. “We’ve had customers for 20 years and I’m happy it stays this way. I really value the trust of our clients,” he says. “Buyers from places like Hong Kong have shown interest in our oil and have asked me to send them a shipping container. But all our annual production fits in a single container,” he jokes. On some terraces there are three rows of trees, others are just 4 meters wide and have room enough for just one line of trees. Some of them are recently planted. Others are around 30 years old. Seventy percent of Morgan’s olive trees are Istrian Belica, or Istrian White, the most common cultivar in this part of the Adriatic coast. The rest of the farm consists of a mix of Leccino, Maurino and Buga varieties. Being in the extreme north strip of the Adriatic, frost is a constant threat for olive trees in this region, Morgan says, as he points to some trees affected by last year’s low temperatures, which reached -8°C below zero (17.6°F). “We have 1,000 trees, but I think that’s enough for the moment,” he tells OOT. His is a family business run by himself, his wife and their two daughters. But, as often happens among Slovenian olive oil producers, all have other jobs apart from the oil production. “Every day, when we chat at home we talk about oil, olives… That’s how we live. This is our life and I am happy that it is this way,” Morgan says.